Guests of Giftapart can get 20% off the registration fee by using code 4753. SOMERVILLE, NJ, January 9, 2019 — Giftapart Inc., the tech startup that has invented a new way of gifting, will be exhibiting its revolutionary social ecommerce marketplace to retailers at the National Retailer Federation annual Retail’s Big Show in New York City. When someone uses Giftapart, they can post the gifts that they want to receive irrespective of how much the items cost. “That’s because our patent-pending system automatically breaks it up into affordable parts, so your friends can contribute the parts that they can afford,” explained Pedroso. “Giftapart is a win-win-win for everyone. It’s a win for the gift receivers because they are guaranteed to get exactly what they want in the precise order that that they want. It’s a win for the gift givers because they don’t need to guess, waste time, or buy something that wasn’t liked. And, it’s a win for the retailers because sales through Giftapart lead to more satisfied customers and less returns,” explained Pedroso. Gift giving has deep roots in the human desire for social interaction and status. It is believed that gift giving may have its historic and cultural origins in primitive cavemen, as a means to express affection amongst each other. Today, gift giving continues its worldwide social importance and is done by all cultures around the world. Giftapart’s event planning “is the best place to plan your event, manage guests’ RSVPs, chat with your invitees, link your gift lists, and keep all your guests’ and your event media in one place,” added Pedroso. Giftapart has filed international patents for its new ways of social ecommerce, event planning, and gifting. The platform is currently released in beta, and the company plans to release app for Android and iOS soon. 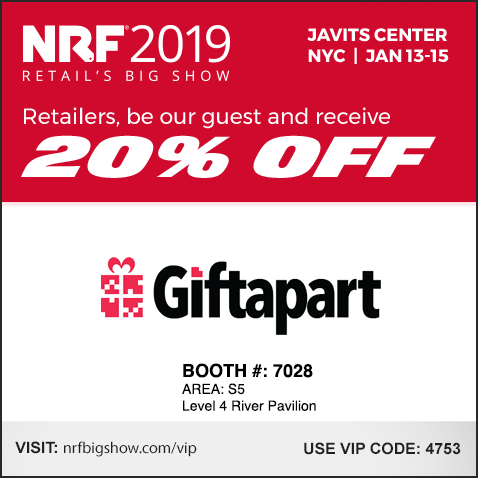 Guests wanting to attend the NRF Retail’s Big Show and get a private demo of Giftapart can get 20% off the registration fee by using code 4753 when registering at https://nrfbigshow.nrf.com/register. Giftapart Inc. has developed an innovative new ecommerce marketplace revolutionizing gifting. The company was established in 2017 and is headquartered in Somerville, New Jersey. The company’s software systems and methods have resulted in the filing of numerous patents. Giftapart is led by award-winning attorney and 3-time elected Councilman Filipe Pedroso, Esq., Founder, CEO and Board Member, as well as its other Board members: Liana Pedroso (a public relations and corporate communications expert with international experience and Master’s Degrees in the field from both Bashkir and New York University); Jeffrey Vanderbeek (prior owner and Chairman of the NJ Devils NHL franchise and The Prudential Center; and former Managing Partner responsible for Capital Markets at Lehman Bros.); Jeffrey Foose (Managing Partner of AERIS Capital, with extensive experience in tech startups, commodity investments, management, software development and accounting); and Henrique Pedroso (a serial entrepreneur and law school graduate, grew and led his businesses with hundreds of employees from the ground-up into successful ventures).